The kitchen backsplash is often an ignored area in most homes I’m finding. I’ve purchased 3 homes in the past 18 years and none of them had backsplashes, including my current home which is less than 8 years old. Builders often skip adding a backsplash, most likely due to added expense and effort. My “backsplash” is comprised of painted drywall…. with SEVERAL coats of paint … to hide all the grime and guck. (Is guck a word? Regardless, you know what I’m talking about). I’m sick of srubbing the “guck” and paint off my walls and I’m now in an active search for backsplash ideas. This will be a nice winter DIY project for me. And I promise to teach you all step by step how I install it! Let’s take a look at some amazing beach backsplash, beach cottage backsplash, coastal backsplash, heck, just plain beautiful backsplash ideas! What ever you want to call them, you will be inspired! Of course I need to start with my own kitchen backsplash. We absolutely love the tile we chose, awash with watery coastal blues, greens and grays with a subtle irridescent glaze. Click HERE to see the details, sources, and installation tutorial. Next up is another favorite backsplash. I am in love with this gorgeous mixed iridescent quartz tile with raised ceramic starfish and sand dollar motif (my logo!) . 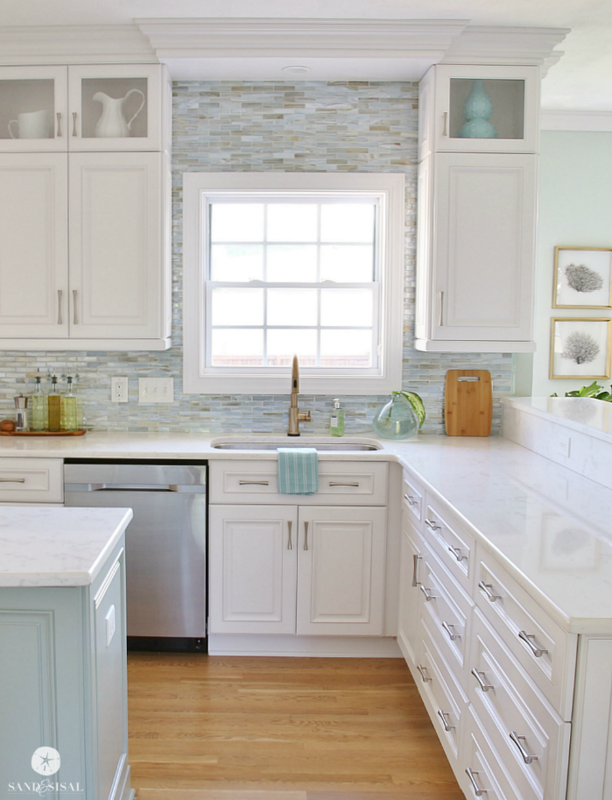 The backsplash is anchored by the sea blue and coral patterned tile just above the counter. This next backsplash is a play on watery blues and gray seascape of the northeastern shorelines. It is from the Sarah Richardson’s beach cottage. The cottage is beautiful. Layla and Kevin’s frugal kitchen makeover uses easy to clean, high gloss bead board for their cottage style backsplash. 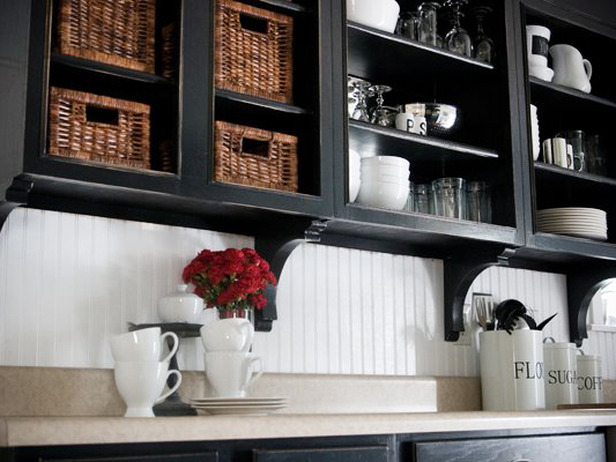 Or consider using wide plank board, painted in the same color as the cabinets for the backsplash. A large 24×24″ granite floor tile serves as this stove top backsplash. If you are using painted boards, I recommend giving them a few coats of polycrylic for extra protection and easy cleaning. 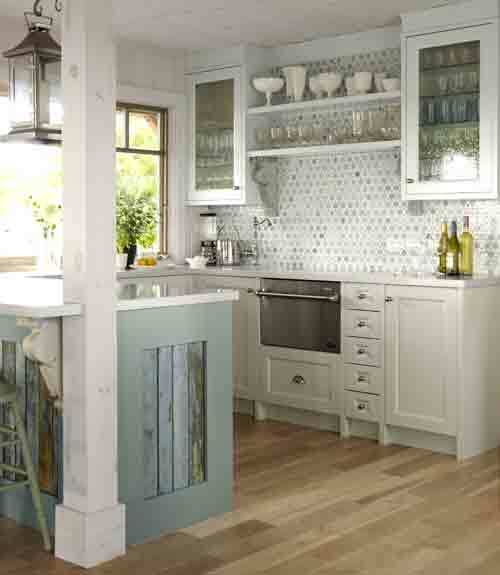 Create a colorful focal point in the kitchen with cool and watery soft hues of the ocean. 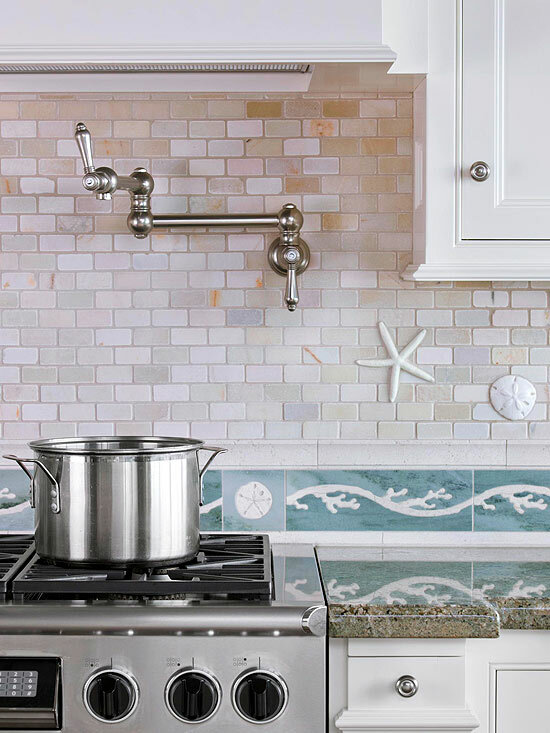 These small subway tiles blend the colors of turquoise, cobalt, and sea grass, and ocean white sea spray and foam. Keep the backsplash clean, fresh, and simple with aqua glass tiles. 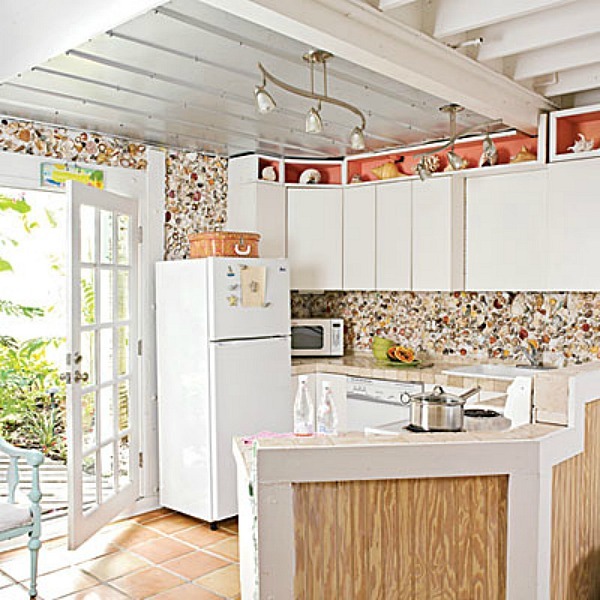 Go bohemian and eco friendly by using your sea shell collection to create a beachy backsplash! I know I have enough shells collected to accomplish this one! Wouldn’t this be adorable for a beach cottage? Did you know that you can have any art work turned into a custom backsplash? 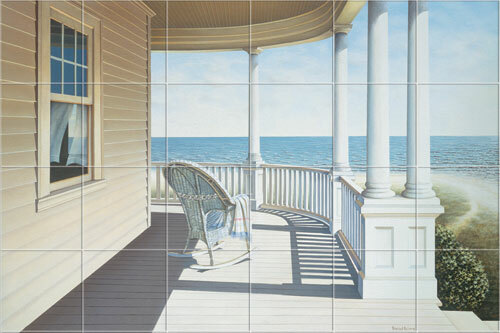 Check out this gorgeous coastal porch scene below that has been transformed into beautiful tiles. Here is another example of using tiles to form a piece of art in a backsplash. 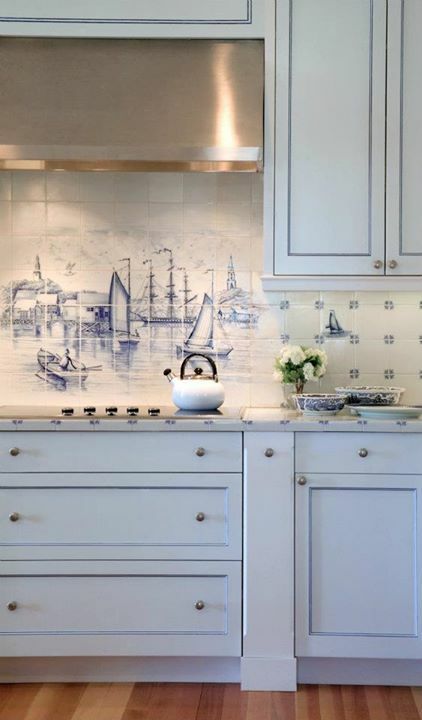 These tiles are a scene captured from the Nantucket seashore. You all know how much I adore SEAGLASS. 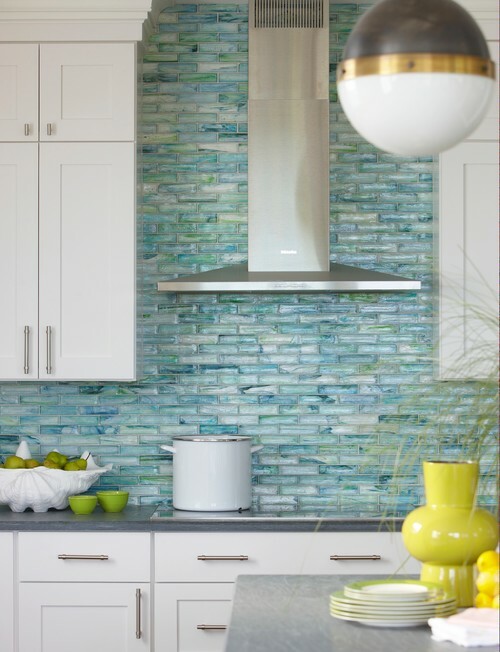 Just look at this amazing artistically crafted backsplash made up of found seaglass! GORGEOUS! 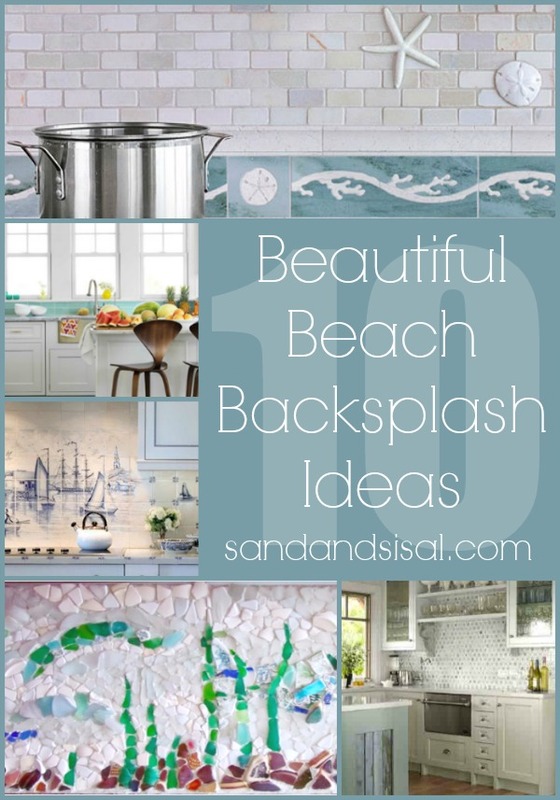 I hope you have been as inspired as I have by these coastal backsplash ideas! I’m almost even more undecided about what I want to do now in my kitchen! Which one do you love most? I’d love to hear from you! Love the Sarah Richardson one! Remember seeing that years ago and falling in love. Layla’s breadboard is a favorite too! We are in the process of rebuilding at the Jersey Shore after Hurricane Sandy. We just had our backspash put in an I really wanted to do a mosaic. I could not sell my husband on the idea. My first choice however is some really nice beach ideas from Wet Dog tile. BEAUTIFUL. You should check them out. Would have loved to have their pieces in my home however they don’t have a supplier near me and with insurance money & lack of help we are getting with our rebuild I couldn’t seriously consider it! 🙁 but highly recommend. 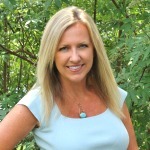 Sandi from NJ. 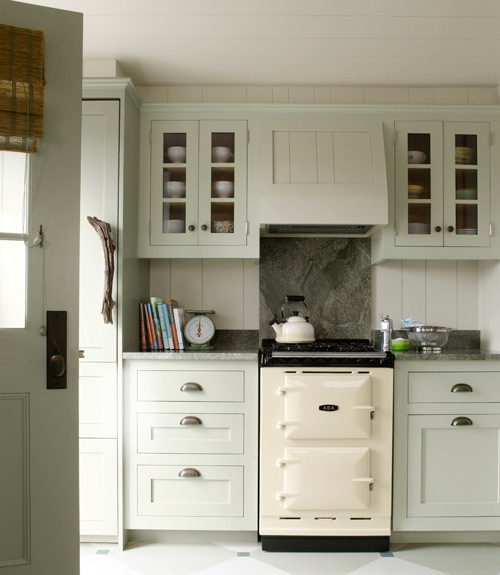 Just the inspiring post I need as I’m planning my kitchen in a fisherman’s cottage! Thanks for sharing all of the backsplashes. Great timing as I’m getting ready for some up-do’s in my kitchen! I have an extensive seashell collection and want to use them to do the backsplash featured on this page in Coastal Living. I wonder how they applied the grout ? Hi, Kim. Great looks. I love them all but favorite is your “absolute favorite backsplash”. I am looking for a backsplash that will remind me of sand to compliment my new white and sea foam colored cabinets and counter. Can you share where the “mixed iridescent quartz tile” came from? Thanks for having such a great page of ideas. Do you know where I can buy this backsplash tile? I’ve been looking everywhere for it and have not been able to find it yet! Thanks very much if you can help!!!! for my kitchen backsplash. Could you please give me purchase information? Hi Beth! I wish I could help you out more but I have no idea where they purchased that tile. I suspect that the shell inlays were custom made. It is a stunning backsplash for sure. One of my favorite tile manufacturers is Lunada Bay Tile (lunadabay(dot)com). They might have something similar to that irricescent tile.